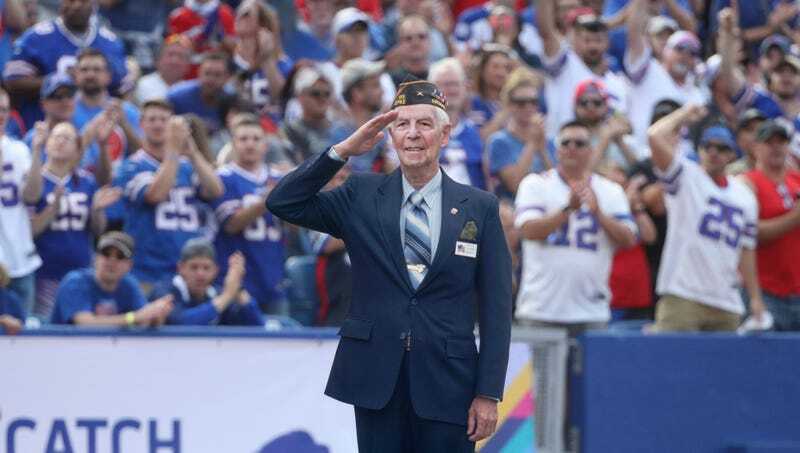 BUFFALO, NY—Fearful of disrespecting the 91-year-old former naval aviator, the crowd at Ralph Wilson Stadium was reportedly unsure when it was okay to sit after honoring a WWII veteran before Sunday’s Bills game. “The speech is over and the applause are dying down, but he’s still hanging around out there,” said spectator Josh Bray, 27, echoing the sentiments of the roughly 60,000 fans struggling to determine if the man being recognized for his service in the Battle of Midway had stopped waving because the ceremony was over or simply because he was tired. “I think he’s starting to head off the field, so I guess I’m going to sit.” At press time, the seated crowd quickly panicked after the smiling, waving veteran was put back up on the jumbotron after reaching the sideline.